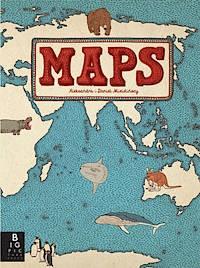 At once a celebration of diversity and an investigation of the natural and cultural offerings that make each country unique, this expansive and impressive book of maps highlights notable people, events, animals, natural phenomena, and typical activities. Each of the fifty-­two maps is richly detailed with dozens of extraordinary drawings and recognizable icons, encouraging an appreciation for the world’s variety of treasures. Hours of fascinating perusal await. Ages seven and up.